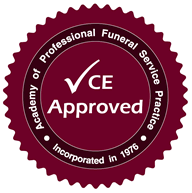 Funeral Directors and Embalmers in Kansas are required to complete 12 hours of continuing education every two year renewal cycle. NOTE: Only 3 of the 12 hours may be completed through self-study per year, for a total of 6 per cycle. The following courses have been approved by the Kansas State Board of Mortuary Arts.